Nick and I with some of our lovely students!!! The final day of our January 26th-March 1st 2015 workshop at Voicetrax West. Everyone did an amazing job presenting their 12 characters that were developed during the workshop in the “mock” agent/casting director general audition. I’m so proud of you all! Next Workshop is Sept 8th-Oct 13th, 2019! 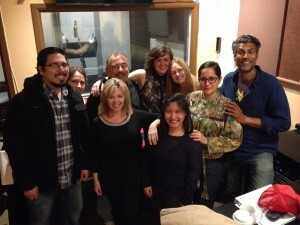 The next Animmersion: An Animation Voice Acting Workshop for Actors will be held on September 8th-October 13th, 2019 for 6 consecutive Sundays from 10am-1pm at Voicetrax West. To sign up, please click here.